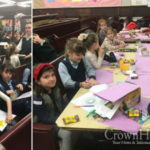 Bais Rivkah Girls’ School of Crown Heights has announced that all grades will be returning to their regular school schedule tomorrow, Friday, May 5th, putting an end to a month-long strike by the teachers of grades 1-3 due to lack of pay. No mention of him in this two page letter. Same administrator and same chairman and you expect change? Hey,what about all the money that’s missing and what about the outstanding 12 weeks of salary for the teachers? No mention of that. Who said that there is missing money? 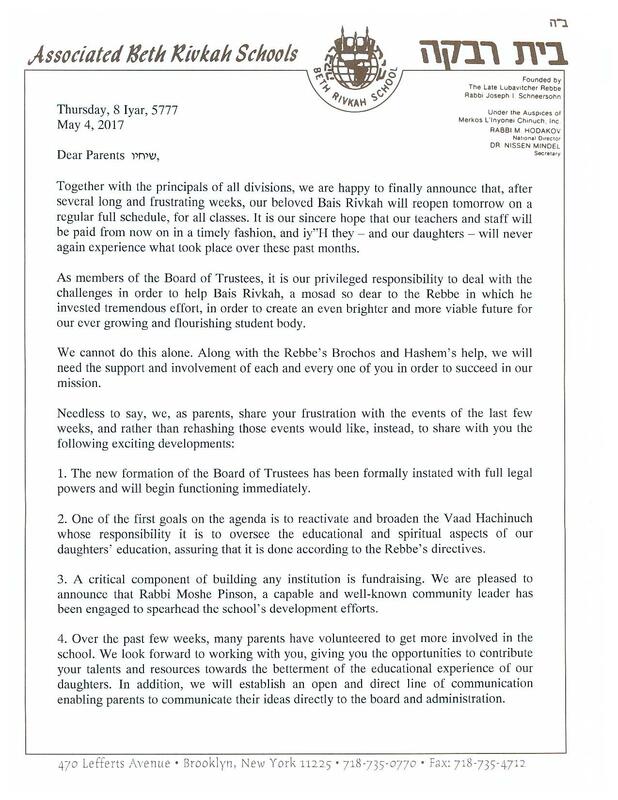 did you see the original article about bais rivkah on another site. – disgusting how they refer to Benji Stock as stock- someone who gave over his life to bais rivkah (and still does) and to Rabbi Shemtov -who only went about stabbing him in his back for the sake of his child. It’s hard to have faith in this new board when they lack transparency from the get go. Rumors have already circulated about loans, usurious interest rates, and real estate collateral. These rumors might be completely false, but without full disclosure we’re all left in doubt as to who made which concessions and at what expense. Clearly a compromise of sorts was reached, but we’re all in the dark about what is still owed to the teachers, when they can expect to be paid up to date in full, and what steps are being taken to ensure payroll stability. Vague references to improved tuition collection, and new fundraising efforts, leave a lot of room for ambiguity. Same with references to the new board’s legal standing, what exactly are their powers. 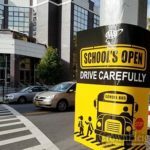 Hopefully there will be a formal communication from the board addressing these concerns, otherwise all we’ll end up with is more rumors and more distrust. What exactly has changed? 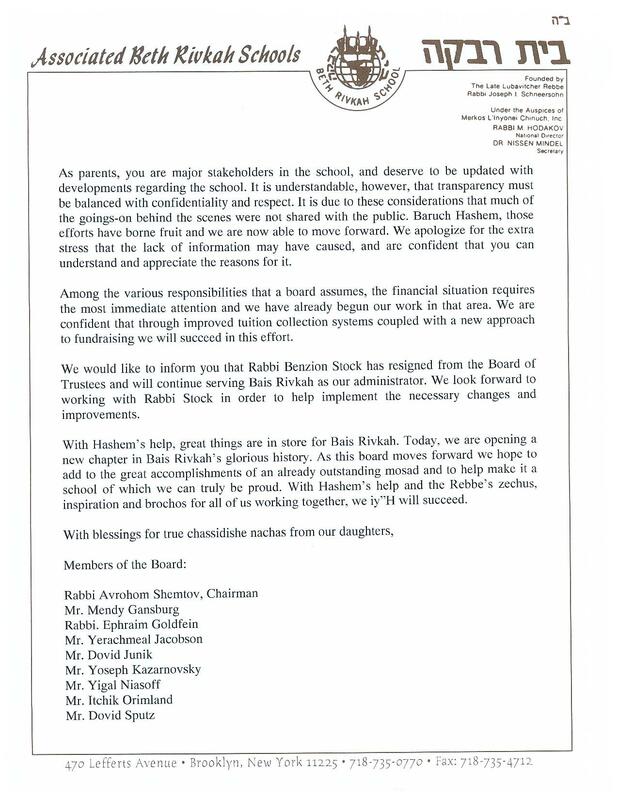 Benji is not on the Vaad – big whoop. Rabbi Shemtov is still in charge & you can look forward to more of the same before Rosh Hashana. I am shocked that the teachers continue to buy into these promises & assurances. 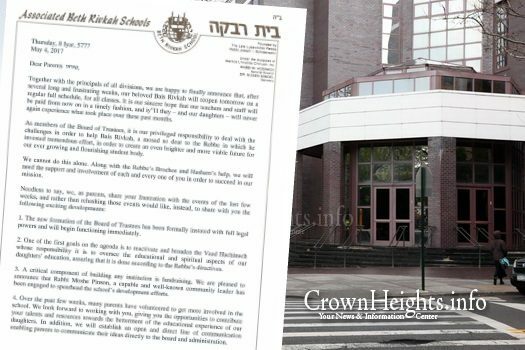 They aren’t stupid women, so what did the Vaad promise? There is no mention of paying even one check. But there IS mention of getting tuition out of parents. How much more can you squeeze out of those who are struggling? And the wealthy ones… are you going to increase their “contributions”? Ask them to supplement reduced tuition? Or just strongarm the poor families with threats and humiliation, as they have done in the past – sending kids home, refusing admission or books, etc. I am so glad all my children are out of this corrupt system, but I feel bad for the next generation who will have to go through this performance year after year after year. Did he resign and return his ill gotten goods?